What's so different about my methods is that I take the "naive" view of nature, which I tested and apparently found sound proof, that modern science made a great mistake in accepting the theory of Niels Bohr and the moderns; that science can only study its information, and so must treat information as the nature of physical reality. Science studies nature, limited by the information we have and the practice of representing nature as determined by theory, when it has always been the exact opposite. The work archived here, mostly from the 90's based on fundamental research in the 70's and 80's seems to answer a question I had when doing my junior and senior physics labs in college: "Why does it seem every run of every experiment somewhat misbehaves?" The answer appears to be that it's because every chain of events needs to involve the explosive local self-organization of the energy using processes doing it, as the way nature turns "the switch" on and off. It reframes the equations of science as describing boundary conditions for natural processes that all individually find their own paths of continuity in order to develop. That's then "what you see happening" to create the vast proliferation of organically developing "S" curves at seemingly every natural transition. I'm not sure what prompted me to mentally experiment with reversing the assumptions of modern science that way, interpreting our information as only helping us understand the limits of natural phenomena. The "naive" view that the phenomena of the natural world work by themselves, and not by our theories, did open doors, helping me to get a whole lot further in investigating my subjects of interest. I had by the 70's expanded my general question beyond "what makes things misbehave" to "what makes life lively" and studying all sorts of lively phenomena. I found more leads assuming that nature works by means other than our information. So, to unlearn the view that nature is made of theory we'd need to teach ourselves to "go back" to our naive point of view, as the door to discovering the more organic processes of nature behind the data we collect, that are really so important to us. To discover the natural systems behind our data what I study are the changing continuities in the data, implying flowing organizational change in the systems producing the data. I use equations some sometimes as boundary conditions, but not to study nature. The equations one might fit to the data only serve to represent the complex reorganization of systems in nature to just one single organization, invented by a scientist. So they serve to erase all information about the system of nature producing the data. Equations then just don't prompt questions about the multi-scale organizational changes occurring in the systems being studied. The basic lens used here to help expose the good questions to ask is a "cipher", composed of mirror "S" curves (¸¸¸.·´ ¯ `·.¸¸¸). It expresses the absolute "continuity of change over time", as being composed of a four part succession of continuous developmental phases, from start to finish, and the transient "changes in the directions of change" between them. Those transient change are implicitly emerging from other scales of behavior, to initiate and terminate each period of progressive change, that the physics theory requires and observation seems to strongly confirm is how physical organization in natural systems generally develops. Table of Contents...Related Subjects... Introduction,..
To learn to think like nature, first learn to watch nature think. Always under construction, some time I'll read the whole thing and fix everything that's out of date! Most of these pages are about a careful way of observing change over time, using hard data and soft mathematical tools, to develop a sensitive guide for studying the connecting flows change of all kinds. Changes in the flow of events reflects evolving organizational change in the natural systems that produce it. The tools are fairly conventional scientific tools, and guided by conventional scientific interpretations of events, but the object is to look beyond the measure to study complex organizational processes, the inner workings of nature's deft transformations. What results are a some surprising discoveries, and a greater appreciation of the emergence and layering of patterns of change in general, causation. It is probable that what you'll find here will not live up to its promise, at least not until you are able to use it with the kinds of change you are most interested in and most familiar with. Much of the focus here is also on mathematical methods and problems. More on how to use the approach might be helpful, but it is given somewhat less attention. Some of the techniques involve new areas of mathematics (empirical measures of derivative continuity, the paradox of indescribable simple pattern in the beginning and ending of events) and contribute to new methods in computer vision (defining landmarks of organizational change), as well as providing a new empirical method of inquiry. The method also involves a new point of view, a super-realism. Why 'super'-realism? It involves watching for, and draws you into, the deep inner workings of particular individual events. There's lot's there. For example, one might ask why intricate patterns develop in fluid flow, say watching cream in your coffee. Even if we can see various scales of pattern, can name a cause such as heat or drag, and make some predictions, there's still nothing but the kinetic interaction of molecules to produce any complex pattern. Somehow the molecules interact to build complex evolving pattern. There are no other communicating forces, no imposed guides, no embedded memories, only accumulative original pattern development in molecular motion, with every part participating independently. This is a common trait of nature's confusing but highly organized behaviors, they happen all at once, with unified orchestration but no central point of control. So much is happening at the same time, and so smoothly going through changes, one has to watch it very very slowly.... A one dimensional trace, say temperatures at just one point, may provide particularly good information on when and at what rates organizational transitions develop. That may point to exactly when, where and what kind of thing to look for to find the mechanism that develops to do it. The same is true for tracing the inner workings of your business market, looking for particular kinds of turning points and then to look more closely for what it is and where it might go. Measures of change over time directly reflect, but poor describe, the complex accumulations of events involved in any process of change. They're not the answer, they're a guide you can use for looking beyond. The common indicator of local organizational change in inner workings of a system is a growth curve, reflecting far more complex events, but accurately displaying their timing. These are typically represented by the 'S' curves, the connecting shapes that are found in virtually every transition. Their shape draws a smooth curve between the static measures as the underlying organizational processes develops a smooth changes between systems of behavior. After identifying a growth curve a few simple checks usually identify what process it is reflecting and at least hint at some of its distributed system of interactions. Beyond the effort to test scientific ideas, what drives the inquiry is the wonderful depth of unique detail that can be found in individual things and events of all kinds. Nature is indescribably deep. Individual events of all sorts display a fantastic variety of local organization at many scales. When you look at them in detail, it is obvious why any mathematical description needs to include uncertainty, there's simply too much there, too much going on to describe. Patterns that can't be understood are called random, and in our data much of the intricacy of nature appears random. Data is such a very poor story telling device. The solution is not to abandon data, but to use it differently, i.e. not as the description of what's happening but as the map or guide for your own exploration of a territory of understanding the map can't directly provide. The particular mathematical aspect of natural complexity focused on here is the continuity, or flow, of change. Much of the work concerns a disciplined analytical tool, derivative reconstruction (DR). It's not magic, but a tool which allows you to discover much more information about the history and progression of change than you would first expect to be available. It's an extremely general technique, applicable to any subject of change over time whatever. Change in anything usually progresses in a self consistent manner, developmentally, displaying the presence and accumulative modification of coherent systems of relationships. By very sensitively representing smooth underlying flows of change DR helps make the details of these patterns more visible. The property of infinitely smooth progression in mathematics is called 'derivative continuity'. It is one of the most fundamental and useful properties of mathematical functions. Physical measures of change often display a similar physical property, the organizational continuity of nature, call it flow. DR uses the mathematical definition of the derivative in reverse to represent dynamic organizational change reflected in measures of physical systems . It doesn't always work, but often does. When it does it often exposes otherwise invisible natural structures and the links between them. Recent investigation indicates that there is a distinct similarity between the primitive elements of DR and those being rapidly explored and developed in the fields of computer vision, artificial intelligence and parallel distributed processing. In the terms of those fields DR is a form of curve generalization, that treats randomly sampled data as compressed information about multi-scale continuities. DR is a method of reconstructing the shapes of physical processes directly from their measures without theories and equations. It uses the idea of derivative continuity, a structural property of mathematical functions. With derivative continuity, change in location takes a period of velocity, and change in velocity a period of acceleration, etc. It all takes time, forming a seamless flow of rates of change without any gaps. In the derivatives of an ordinary equation near any point there is information about the entire future and past of the curve. The physical systems underlying flows of nature are more complex and changeable and the information about them usually less complete and less accurate, and, the range over which distributed information about the curve can be found varies a great deal. The point though, is that the distributed information in a series of measures about the flows of a physical system is of the same kind as of a continuous mathematical curve, and that you can find much more when you look for it than when you don't. Sampling a smooth, but complex flow of change may produce a pattern of points that appears randomly scattered. If you have no information about the underlying process then you can treat the data as form of compressed information about a flow. You might have some other reason to expect an underlying continuity or simply want to see if recognizable forms appear when it is looked at as if it had continuity. Using the implied progression of the derivatives to reconstruct some details of what went on in-between the data points is then a method of data decompression. When it works, it displays previously unseen fine dynamic structures directly, without requiring any preconceived theory of behavior. It also produces a new kind of mathematical entity called a 'proportional walk', having the mathematical property of derivative continuity, but no equation, composed instead of a finite sequence of points and a parsimonious rule for how to connect them with continuous derivatives. Throughout all fields of scientific research there is a tendency for investigators to see whatever it is they are looking for. In a way that is both more and less of a hazard with derivative reconstruction. The curves produced are more strongly data driven than perhaps any other method, so the likelihood that they represent some real feature of the data is quite high. The problem lies in interpretation, generally requiring a thorough immersion in the detail of the subject, to know what the data represents and what assumptions about the different features of its shape can be made in the process. There is also a philosophical problem. Reconstructing and studying the individual dynamic flows of change raises a question concerning whether to view nature with either a deterministic or probabilistic model of events. Neither seems appropriate. Individual processes are not probabilistic, since that paradigm applies only to classes of events. Flows of individual events are also not even remotely deterministic. You rarely find any fixed patterns. At the beginning and end of any apparently deterministic pattern (because they all begin and end somewhere) there is an indeterminate change in pattern. To make a possibly long story short, the inevitable conclusion is that individual events need to be seen as something else, call it 'opportunistic', displaying processes of discovery rather than of following rules. How individual events actually come to have the unique and intricate structures they display is clearly not by humanistic volition and intention etc., and it is not that sense of their being 'opportunistic' that is meant. It is only that new behavior begins to develop when, and only when, the appropriate circumstances arise, and then develops in a manner displaying continuity. A theoretical study shows that this implies that change begins with a very specific and recognizable mathematical shape. The computation routines used (see Tools & StatTechnique) were developed in AutoLISP, the programming language of AutoCAD, and run on a PC. When proper care is taken the immediate usefulness is that the method tends to uncover evidence of surprising patterns of change. In long studied data these newly appearing patterns are often different from what others have found. For example DR offers a direct means of identifying dynamic coupling between complex systems, without having any behavioral theory for either one. (warming3.gif, econcync.gif). Sometimes this brings into question strongly held notions about very well studied processes. - Emergence and the Law of "little bangs"
Equations are usually made to fit many sets of data at once, to represent idealized behavioral structures. Here the proposal is to use the constructed curves fitting the detailed shape of individual sets of data to represent the unique structures of individual events. It is used where it can be reasonably assumed or concluded that the data reflects a continuous physical process which can be treated as having derivative continuity. The more general principles of organizational continuity follow from general observation and a physics of conserved change. The critical point of physics is a straight forward derivation from the conservation laws, assuming only that rates of energy transfer must be finite. It demonstrates that all physical change must satisfy a principle of continuity & divergence. It seems to imply that the only ultimate discontinuity in nature is in information. That doesn't indicate when you have enough information to identify the continuities, or "little bangs" that may be present, of course. It does point to where you'd need to look for them though. Quantum mechanics, for example, concerns a range of behaviors beyond the known limit where a knowledge of continuity is possible. There's no conflict in a lack of information, just various kinds of assumptions you can make about it. What one starts with in observation is information without meaning, like a series of points with no necessary relationship between them. It could be a history with a fascinating story to tell if you could connect the dots with the processes that produced them. To interpret a curve as suggesting a process, one needs to ask how to determine when a series of points can be treated as information about a continuous process there's a series of general questions to ask. Was each recorded the same way? Are there any recognizable shapes? Are there enough points for the kinds of mathematical tests you might try? Is there any reason to think from the environment there was any accumulative change?. Are there other things that might be affecting the points? One exercise to begin learning the technique is to look at a time series graph and see if you can think of two or three possible explanations for each bump. Having explored the context of the shapes and processes that might be involved, ask if there's any overall shape. That can be by simple inspection, learning the specific steps taken to collect the data , using statistical measures, or by other means of determining that the data most likely represents some derivative continuities. Just because there are breaks in the shape of a curve does not necessarily mean there is a break in the process producing the curve. The activity of the process may have switched to somewhere else for example. Studying complex systems involves developing an intuition for questions like that. Others would have other lists. Four of my lists of them are arranged as a list of principles. some advanced methods are described for identifying cybernetic body parts and things in complex systems and learning from them. This site is mostly about the work I've done with analyzing one dimensional curves for the questions they raise about the processes that produce them. The analytical methods I developed are described below in 'Tools' and a little within the Autolisp program files in Curve.zip, and in a long 1995 paper. The discussion of analytical principles begins on p12 and is followed by an appendix describing the routines developed at that time starts of p35. There are various ways to use the derivative continuity of time-series data to reconstruct the shifts in continuity of underlying processes. The trick is to see the difference between complex fluctuation and noise. One is meaningful, and the other not. Many people start with curve fitting, perhaps a spline curve, to represent the data as a smooth continuous curve, that treats all fluctuation as noise. Here the routine is derivative interpolation (DIN), which projects interpolated points by matching 3rd derivatives from before and after. For validity it is necessary have good reason to guess that your time-series data points lie on the path of some continuous process (i.e. not random or a random-walk). Scales of larger and smaller fluctuation are the most common finding. Estimating the inflection points and growth rates for the larger scale fluctuating processes is usually the interest. That can be greatly improved by representing larger scale fluctuating processes as curves drawn through the centers of the smaller scale fluctuation. That can be done by connecting the inflection points (TLIN) of the smaller fluctuations, called 'integral interpolation', or finding the 'dynamic mean'. The fluctuations in a process are usually symmetric and represent elastic variation in the underlying behavior. Sometimes the variation is one sided and the maxima and minima of the fluctuations are used to represent the norms of the underlying process. The effect is quite often to display surprising structural features of the real underlying processes that would not have been visible by any other kind of representation. The routines available are written in AutoLISP (one of the programming languages of AutoCAD). This platform was chosen for the purpose because it allows curves with any number and spacing of points to be related in the same 'table', and is fully programmable. For conventional statistical analysis the data is transferred to a statistical package, such as JMP. Suggestions of alternate development platforms would be quite welcome. Current updates available on request. Mar 97 reverse test - How it really works, a complete demonstration of the DR method. Each of the following sections is a brief study of a particular time series data set. The graphs display the data, a series of interpretive curves and some notes on methods and interpretation. I am always interested in finding other interesting subjects of dynamic environmental change for study. One of the most astonishing events in the heavens are the enormous energy bursts of gamma rays that now seem to occur during the birth of black holes. Gamma ray bursts are the largest explosions in the universe, producing the energy of 1000 supernovae at once, in a period of a few seconds to a few hundredths of a second. They are observable from earth once or twice a day from apparently random directions. This study of the microscopic dynamics of one such event, based on the counts of gamma rays recorded per second from a gamma ray observing satellite. The motion of the earth's continental plates is very gradual, and any changes in the rate of movement might be assumed to be imperceptible. Good time-series measurements of the physical location of 'fixed' sites on the earth are now becoming available, gathered with satellite observation by the USGS Global Positioning System (GPS). A search for better data and method refinements are needed to make this approach more revealing. The directly observed rates of plate motion are minute, 1 cm/yr, and the data is significantly noisy. The particular kind of noise is problematic for the current DR technique, in that the noise is large scale and often clustered and one-sided. Derivative reconstructions of the motion of neighboring sites in the San Francisco/Oakland basin (called PBL1 and TIBB), appear to display both matching accelerations in the tectonic flow and matching noise events in the calibration of the measure. The CO2 concentrations in an Antarctic ice core over the past 150,000 years follow a remarkably smooth curve with a semi-regular 3,100 year period of fluctuation. There is also a distinct semi-regular 12,500 year period, and a couple large scale singular events. The overall shape is dominated by two major jumps, 140,000 years ago and beginning 20,000 years ago, with a general slide in-between. The recent atmospheric CO2 trend is shown for contrast. The shapes found in the curve are not definitive, but suggest a long term stable system occasionally perturbed by great events. One of those great events is clearly the current relatively explosive rate of increase, considerably higher and growing at 50 times the steepest rate found throughout the past 150,000 years. The most interesting feature of the ancient record is the amazingly smooth progression of the data, seen close up in fig. 2. The underlying process appears perfectly regular and does not appear to have any fluctuation more frequent on average than 3,000 years. That is extraordinary log term regularity! Perhaps it is driven by something like magma upwelling, or a glacial solar cycle, or there is some diffusion process within the ice which perfectly suppresses the shorter fluctuations without suppressing the larger ones over time. The 100,000 year decline might reflect the general rate at which carbon is withdrawn from the biosphere. The dramatic rise that began just 20,000 years ago might just possibly represent the extensive use of fire. The study provides an interesting demonstration of the ability of DR to highlight, and repair, a bothersome calibration irregularity found in the original data. The second derivative of the data is still remarkably smooth, except for what appear to be occasional single point spikes due to calibration errors in data collection. The analysis of underlying behavior is that what appears as a general trend of decline interrupted by events of increase may actually be the reverse. 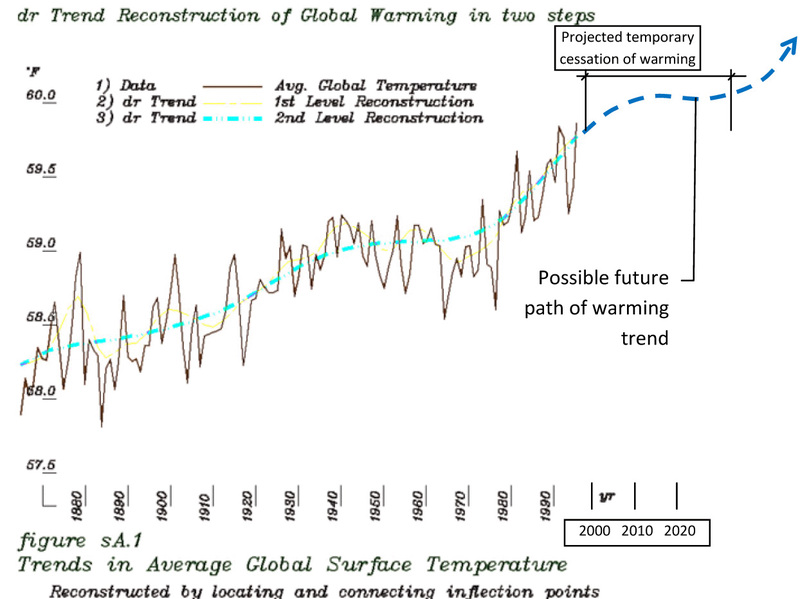 This is shown by the second derivative of the trend of 12,500 year fluctuation showing a positive norm punctuated by transient negative periods. Bjorn. Malmgren gathered data on the size of a plankton species over 7 million years from an Indian ocean deep sea sediment core covering the transition from one stable form of a plankton species to another (G. plesiotumidia to G. tumidia). During the transition in shape the organism also tripled in size, giving a good corollary indicator of the progression. The data only hints at it at first, but yields clear evidence of continuous growth processes, repeated eruptions accelerating and decelerating progressive rates change, producing in continuous developmental transition between two steady states. There are other interpretations to consider, but the appearance is of mutation having proceeded by a complex feedback regulated process. The validity of applying continuity analysis to evolution comes in part from finding a strong linear relationship between the mean sizes of each sample and their standard deviations. That variation in size is correlated with size is not surprising perhaps, but it does contradict the commonly held 'null hypothesis', assuming that the data was produce by what is called a 'random-walk'. The variance is neither invariant nor constantly increasing so the random walk assumption for individual lineages or the whole population does not fit. A second, and more specific contradiction of random walk and demonstration of underlying continuity in the data is provided by the step variance test. It shows that the variation between widely and narrowly spaced points does not differ like it would for random walks In a random walk the variances would multiply with the number of points. The variances of the data do not. This indicates that the irregularity of the data is noise, and that recognizable shapes of continuous processes that are visible through the noise probably indicate the presence of a corresponding mechanism. A rapid continuous developmental process that began and ended seems indicated and the kinds of mechanisms that could produce that are considered. Because the standard deviations are related to plankton size by a linear relation both can be used as indicators of the shape of the transitional events. The values of the standard deviations were rescaled by that linear relation so that its shapes would be properly scaled for comparison. Both the size and std. deviation curves were derivative smoothed and interpolated and both show an appearance of a similar progression. The first derivatives of the two curves make the point much more clear. They are remarkably similar despite seeming larger differences in the shapes of the curves themselves, and both display the presence of a dramatic transient underlying process. A slightly different approach to resolving the true shape underlying the noise in the data is provided by studying how widely the various shaped are distributed, using the curvature scale space approach. The detailed curves and steps are shown more clearly in the full figures. A curious appearance of clustering in the data has been given a very brief and incomplete study. The average global surface temperature over the past 100 years has tended continually upward, but with both short and long wave fluctuation, and in the 90's was rising at the highest average rate of the period on the upslope of the long range curve. 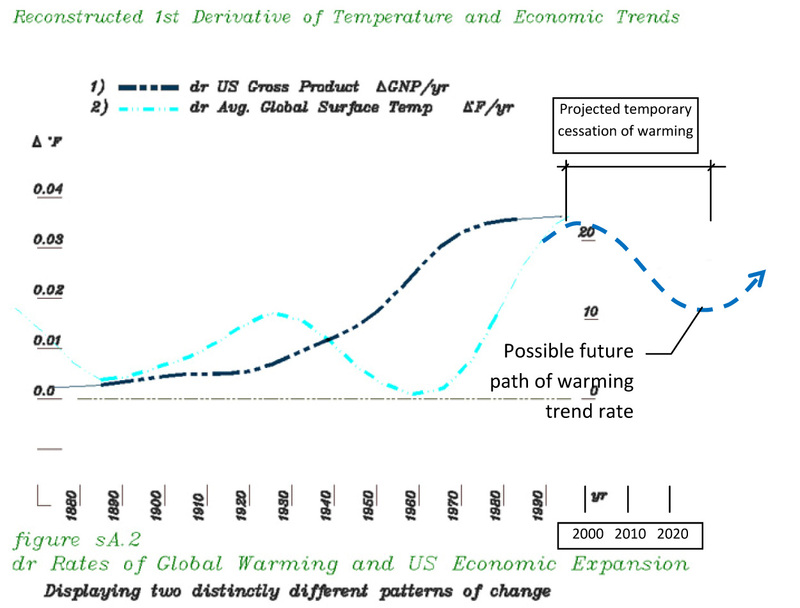 Comparing the rate of change of warming and the rate of change of economic activity with US GDP, the derivative reconstruction curves(1) show the long term trends shows no apparent dynamic link between warming and the general increase in economic activity. Economic activity is related to energy use and fossil fuel consumption, and the contribution of CO2 and other pollutants to the atmosphere. This should be further studied. One possible reason why the underlying dynamics of the two systems do not match is a variable lagging and leading response of the climate system responding to the forcing of CO2, visible in the data as a long wave fluctuation above and below a rising norm. It doesn't mean that atmospheric CO2 doesn't influence global surface temperature. It just means that something else that speeds and slows the process alternately is happening too. Having now found data ( Next study below) that does appear to demonstrate a direct dynamic link between warming and CO2, the question is what is the larger effect, and how will it exaggerate or hide the warming effect.. The long wave curve looks like a climate system fluctuation that might have momentum and be repeated. That is quite common for system change, that there are multiple scales of fluctuation. If so, that might begin to produce a period of actual atmospheric cooling, or a pause in warming, to hide continued CO2 induced warming and give people a false impression that warming has stopped*. I've drawn what looks like the probable scale of the momentum of the large scale fluctuation, but this should be revisited with better data. Click the images the temp. curve(A.1) and rate of change curve(A.2) to enlarge. In 2007 a slowing of warming of just this type was noticed as associated with increasing cloud formation in the tropical latitudes, the Iris effect, Lindzen 2007 and seemingly substantiated by Spencer 2007. Both authors consider the evidence of a pause in warming as a permanent effect, but I think, especially if its timing matches the 'long wave' seen here then it is probably a new kind of "El Nino" effect, but in the atmosphere. The underlying pattern of economic growth rates over the past 130 years shows a tendency for rates to steadily decline. Steady decline is found throughout the period, interrupted only by one dramatic rise, corresponding to the period of the great depression and WW2. The resurrection of growth rates following long decline could be evidence of a global turnover in the capital structure new directions get a fresh start and the old regime is abandoned. Paradigm shifts in technologies, methods and values should show up in the long term growth rate some how, if they were actually transformational. Whether a resurrection of the growth rates after a long period of decline is cyclic is possible, but doubtful. It is, of course, also unclear how long any paradigm shift will sustain growth or whether another paradigm shift will automatically appear any time an old one one is exhausted. A fascinating regularity is apparent in relationship between the second derivatives of the underlying trends of US GNP and Unemployment Rates. There is a remarkable synchrony between the turning points of the underlying derivative rates of change, seeming to indicate that neither is a leading indicator of the other, acting as if the two are expressions of some other strongly unified inclusive process. The reported cases of Measles, Chicken Pox and Mumps in New York City from 1928 to 1963 are data sets dominated by chaotic variation. (Olsen & Schaffer Science 3/8/90) DR technique was able to identify underlying regularities of some possible interest but with such poor confidence. Nov. 1999 Sparks; a first look in a new area. I'd love it if someone would tell me where I can find detailed data on the growth phenomena of electrical discharges, sparks, lightening etc. Sep. 1999 Patterns in Crime the record shows clear events in youth culture that are separate from the society at large, thought this brief look only points to events that are local. What that suggests is that their dynamics were local and internal, and raises the question of where they were occurring and what erupting to produce their dynamics. Oct. 2005 Crimewave's birth and collapse I studied great crack epidemic of the late 80's in some detail, because of its dramatic end. The linked report is only a summary research note, about the fascinating secret. 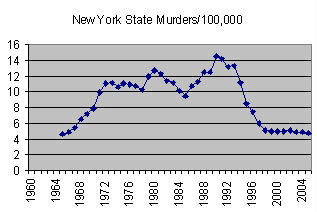 The dynamics show a clear true collapse, starting about three years before the reputed influence of Mayor Giuliani. There's no bend in the curve for Giuliani's mayoralty at all really, reinforcing the idea that it was the cultural change the broke the crime wave that got mayor Giuliani elected, not the reverse. Perhaps it sounds a bit speculative, but in fact the great crime wave passed rather abruptly like an intense fever as the whole community of addicts and their families rejected the crime culture in their midst. It was an abrupt dramatic silence to bring to an end the 30 years of youth violence that began in the 60's with the rage following recognition of civil rights for the black American and Latino communities that resulted in the emergence of major youth crime cultures in all American cities. So I went out and did a number of interviews on the streets of Harlem and the Bronx to see if people remembered what it was that happened, finding that 15 years later they only vaguely remembered. I pieced some of it together, I think, from talking to enough people and having lived in one of the high crime neighborhoods of Manhattan when it broke, and so recalling having watched it first hand. There may be other scientists who have done so, but I have not read about it. (http://www.synapse9.com/cw/cw_interview_notes_10-22_audio.pdf) The study was not meant to be exhaustive, and but to explore my method with a minimal amount of effort, to see if some better questions would come out of it. Oct 2006 Emergence of Sustainability This brief research note shows how to trace the frequency of a key word or phrase to investigate the dynamics of changing ideas. In this case the word 'sustainability' in NY Times articles shows a dynamic long term growth phenomenon punctuated by dramatic flurries of conversation linked to the individual articles discussing the subject. Feb 2006 General System Theory's Collapse This brief research note is another example of using word use frequency to trace the evolution of an idea.